Winco is now carrying a line of gluten free products...YAY! So I picked up the gluten free bagels from Udi's. 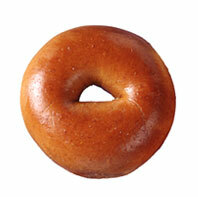 Looks like a bagel! Toasts like a bagel! It didn't quite TASTE like a bagel. But it did taste good! Overall I gave it a thumbs up! At a buck a piece - I won't buy them too often but if I gotta have round bread these are my pick! Great texture, great flavor...these double chocolate muffins are delish!